Almost every day I have someone ask me what does a short life line mean? Many of those people believe that they will not have a long life. Is it because some inexperienced palm reader told them so? Or is it just their conclusions? I want to set this straight and explain what it means. You might not believe it, but I have seen people with ‘no life line’ at all. Do they still have a healthy and long life? The answer is yes. What about people who have no hands? Can they have a typical length of life? Again, the answer is yes. 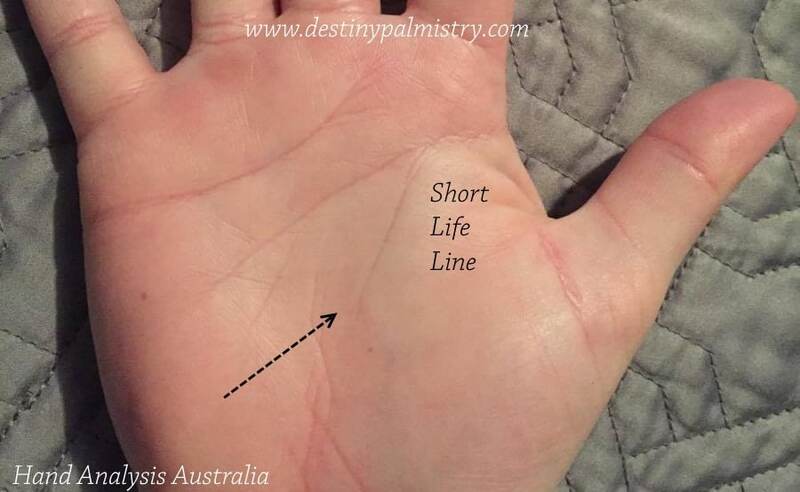 The way a life line forms, depends on the other lines on the hand as well as the thickness of the mounts. For instance, if you have a deep Simian line with well-developed mounts, the chances are that the life line is short. If you are young and haven’t made yourself set life goals, then your lines are still changing or growing. 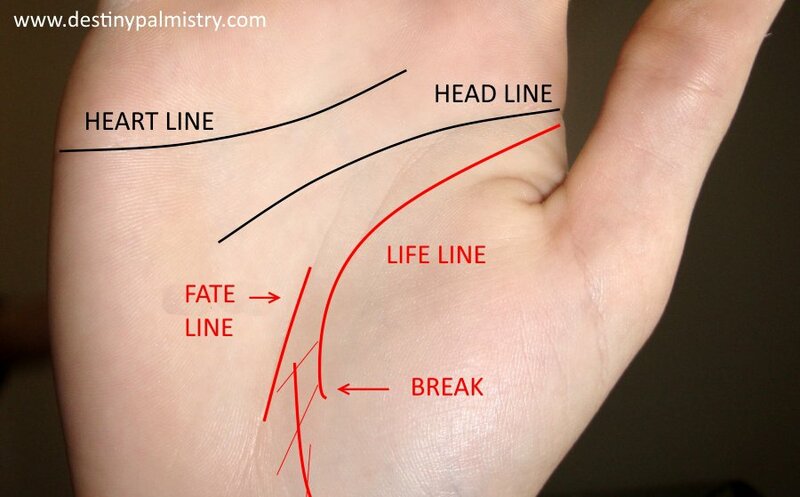 If you are unsure where it is, it’s the line which wraps typically around the ball of the thumb. It is one of the first lines formed on the palm by the time the human embryo is eight weeks old. If you were never to clench your hand, it’s possible that all the lines would fade away over time. The type of work or hobbies you have can also affect the shape and length of the line. The short or thin line does not indicate a short life, just like a long life line does not guarantee a long life. If you have a smooth ball of thumb (mount of Venus), it is likely that the line surrounding it will be weaker. If you are a person who lives through emotion and you feel like the heart rules you, your heart line shows as the most robust. In such cases, others might be weaker. The most robust lines on the hand show what rules you live by the most. In the case of a strong head line, you would very much be practical and rational. If the line of life is the strongest, you are physically driven and do not like change. Are you confident in your life plan? Have you got strong beliefs and set rules for yourself and your close ones? Are you motivated and energized about your career or family goals? Do you know what it is you want out of life, and you are going after it? Do you feel grounded and have extensive family roots and strong traditions? Do you have a routine and habits, such as mealtimes, work and in the home? Are you substantially driven and always doing something physical? If you answered no to most of the above, you might have a short life line. Someone with a long line of life would say yes to the above questions. There are no right or wrong answers, only different personalities. The short life line also shows a more quiet and shy nature (depending on other hand features). While you might think you have a short one, it might be just that the fate line takes over it and they ‘share’ the same path. I have this type of line. It can suggest that at a particular time in your life, you will have a significant change. It might be a change in career, family, marriage or a significant move. Whatever the change might be, the fate line acts as the life line. Look closely at the line to see if it has a sister line or if it continues parallel in another location. A broken one is almost certainly a sign of change, especially if the subject has changed their country of birth. Watch my video about broken lines here.